The Center hosts a brown bag series at our office in downtown Manhattan, inviting speakers from New York City and around the country to present on topics related to fertility and reproductive health. 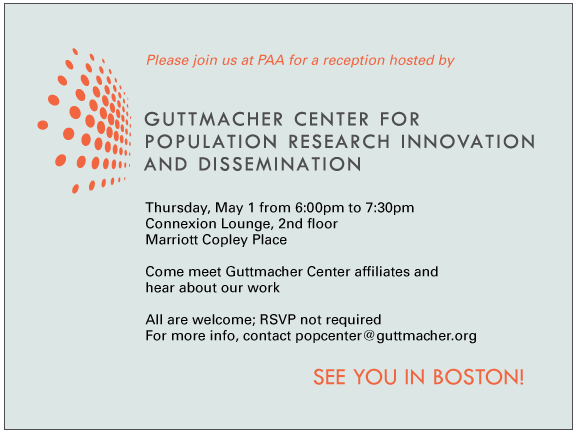 During PAA, the Guttmacher Center for Population Research Innovation and Dissemination and Guttmacher Institute will be at Booth #203 in the Exhibit Hall. Stop by to meet Center Affiliates and learn more about the Center and its public datasets. A selection of recent publications from the Institute will also be on display and available in electronic and hard copy. In conjunction with the PAA Annual Meeting, the 2015 Psychosocial Workshop will be held at the Hilton San Diego Bayfront on Tuesday, April 28 and Wednesday, April 29. The workshop brings together psychological and social scientists and related health professionals in a small meeting setting to discuss various topics including abortion, women’s health, and sexuality. Susheela Singh, Fátima Juárez and Ann M. Moore participated in this meeting, organized by the IUSSP Scientific Panel on Abortion Research in Nanyuki, Kenya on June 3­–5, 2014.